Early September in Maryland. Last updated: 9/19/2011. Above and below: This cooperative Buff-breasted Sandpiper stole the show during an MBC field trip to Assateague Island and vicinity - Murray Sod Farm, Worcester Co., Maryland (9/10/2011). 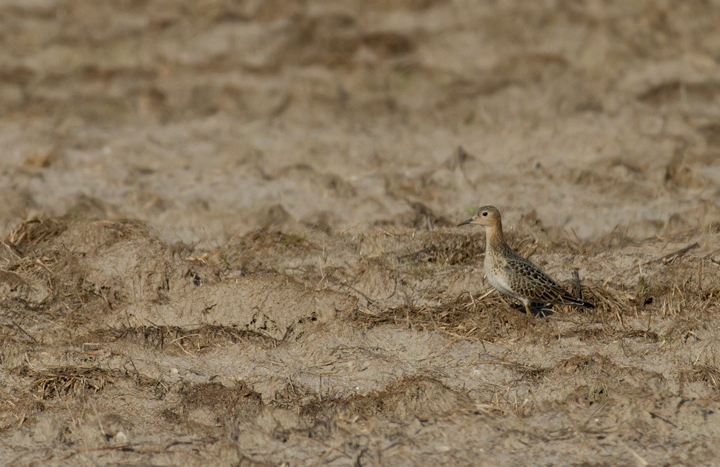 Below: One of three Buff-breasted Sandpipers at a Wicomico Co., Maryland sod field (9/10/2011). Found by Ron Gutberlet. 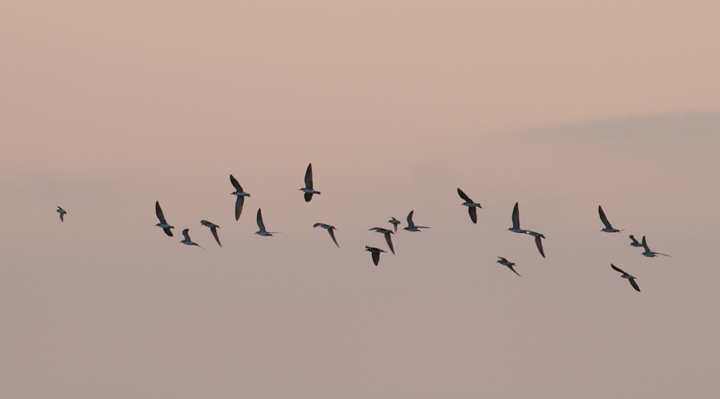 Below: A reminder to scan all flocks! 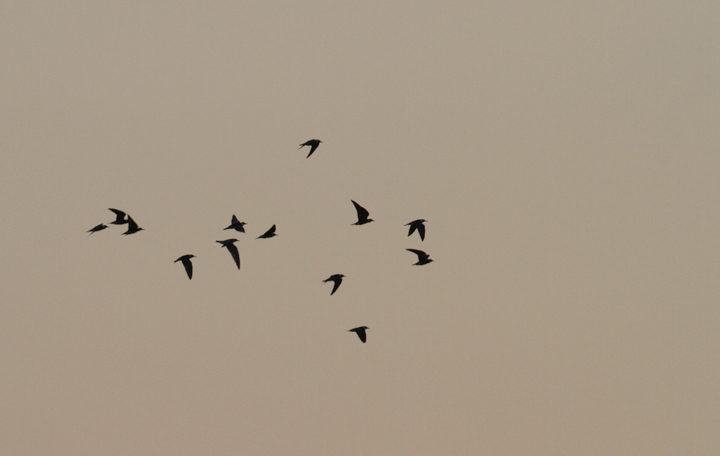 Two county rarities make this flock of starlings a lot more interesting. 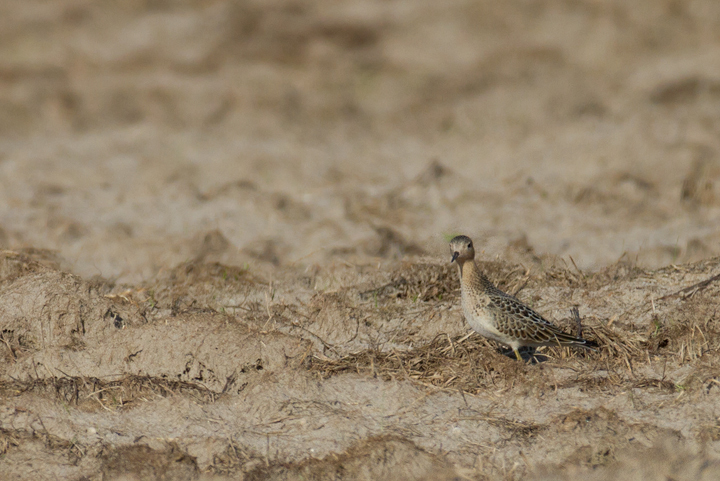 The juvenile Buff-breasted Sandpiper is a fourth county record for Charles. 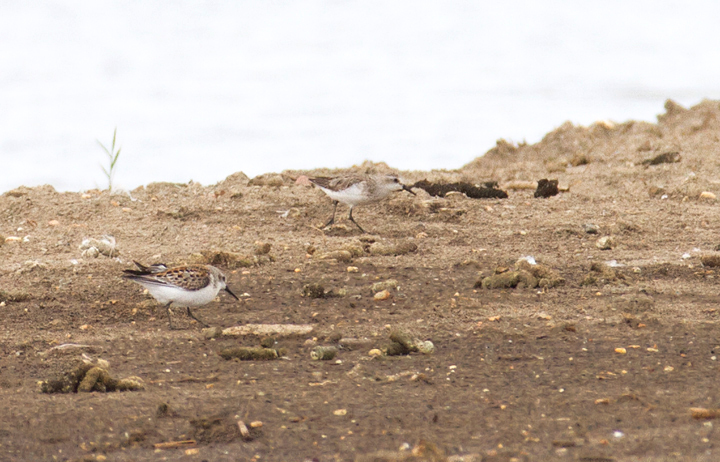 The Ruddy Turnstone is also one of few records here. 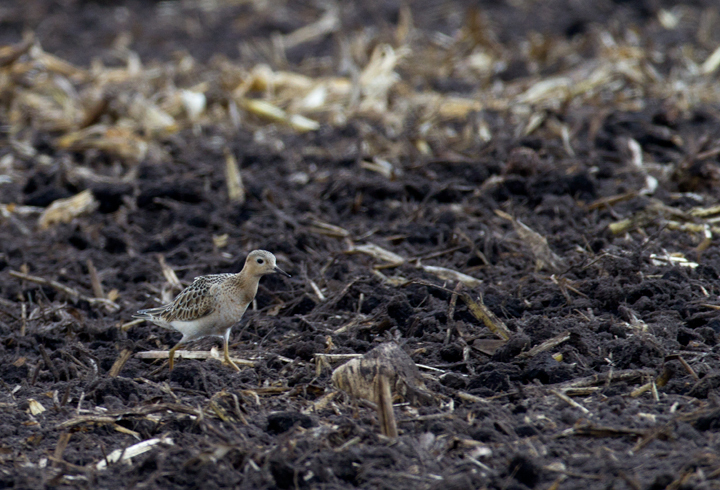 Spotted by my friends Ron Gutberlet and John Hubbell while we scanned a plowed field. Click for larger version. 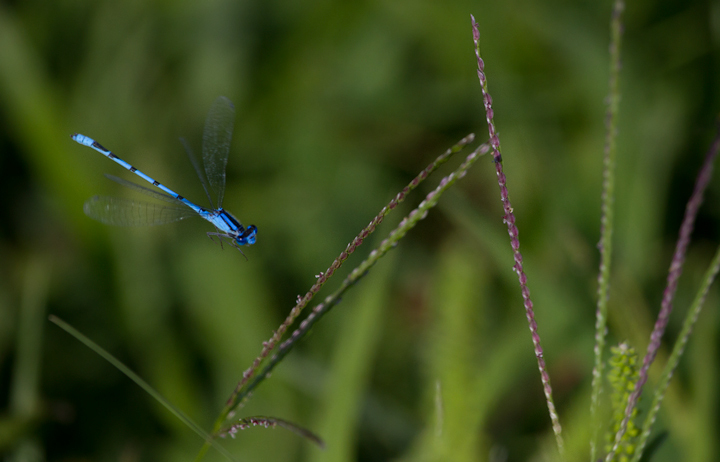 Below: A Familiar Bluet, abundant locally in late summer, in Harford Co., Maryland (8/31/2011). 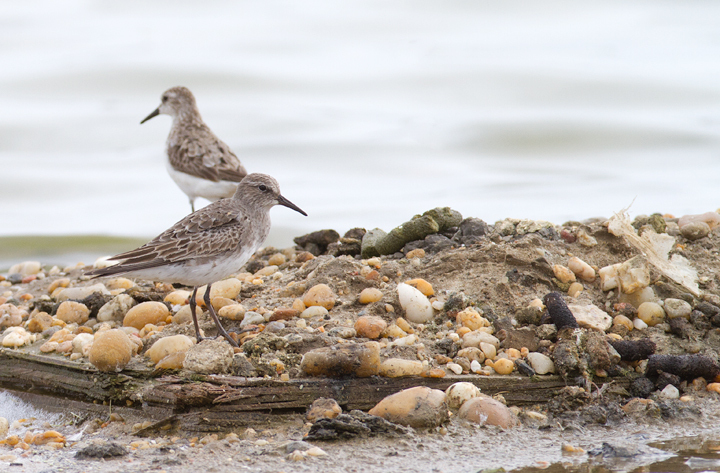 Below: A White-rumped Sandpiper at Swan Creek, Anne Arundel Co., Maryland (9/5/2011). 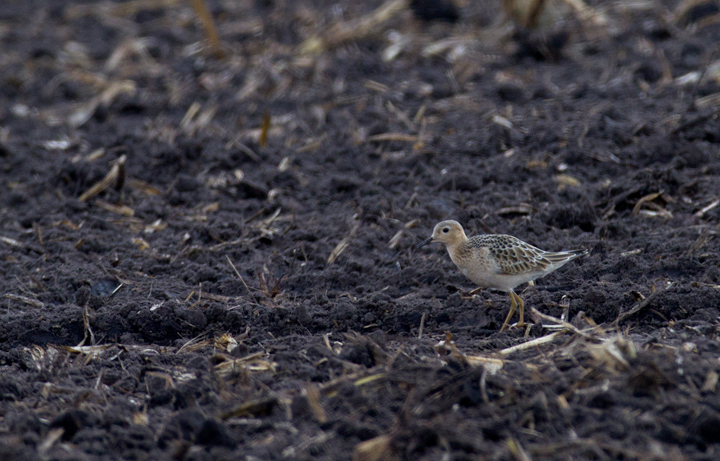 Below: The first juvenile Western Sandpiper of the fall in Anne Arundel Co., Maryland (9/5/2011). 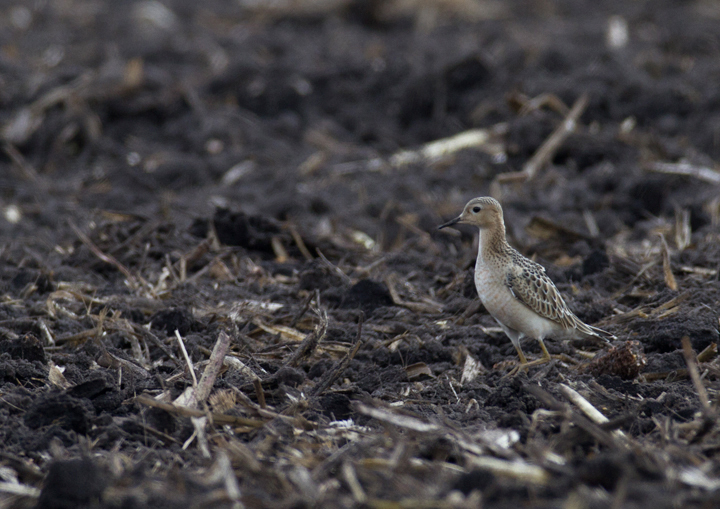 At this date, our adult Westerns are already well on their way to basic plumage. 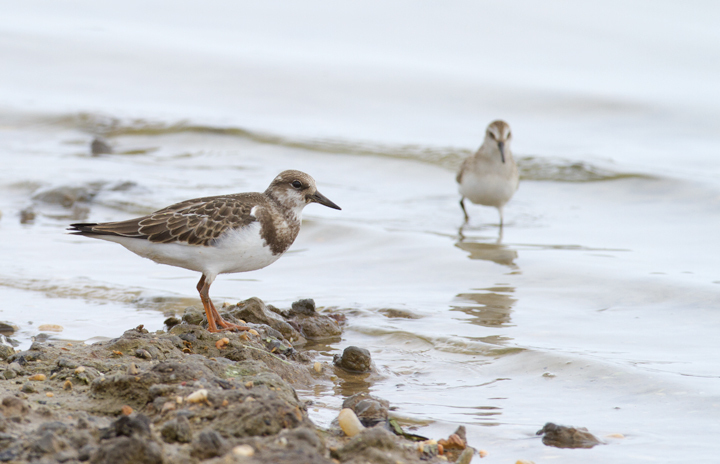 Below: A juvenile Ruddy Turnstone at Swan Creek, Anne Arundel Co., Maryland (9/5/2011). 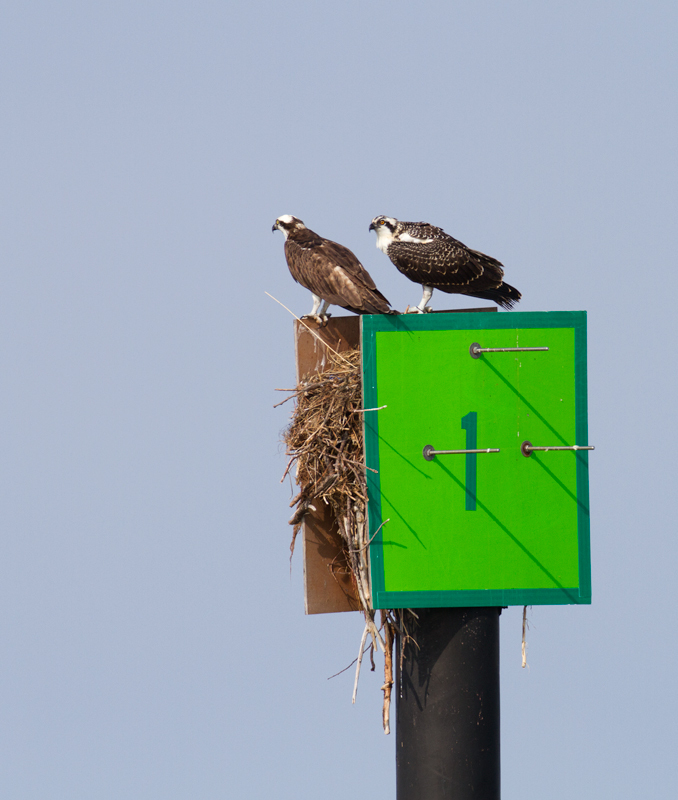 Below: A juvenile Osprey (right) hangs with its parent (left) at Point Lookout SP, Maryland (9/3/2011). Both will soon depart for points south. Osprey migration is already well underway, and numbers will drop off significantly by the end of the month. 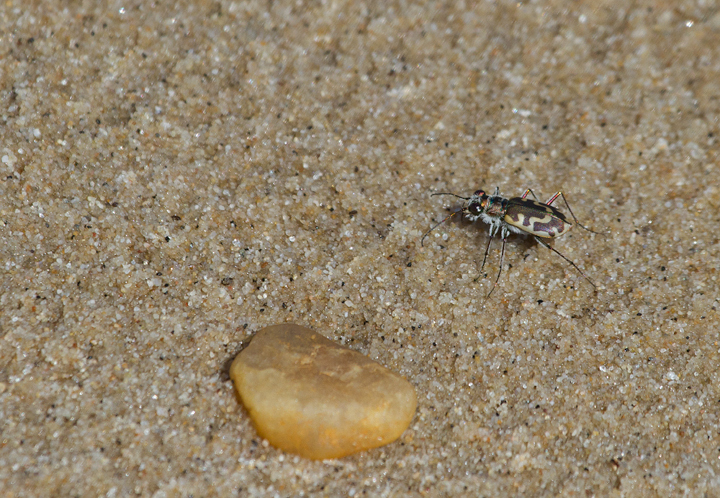 Below: A Hairy-necked Tiger Beetle in Charles Co., Maryland (9/3/2011). 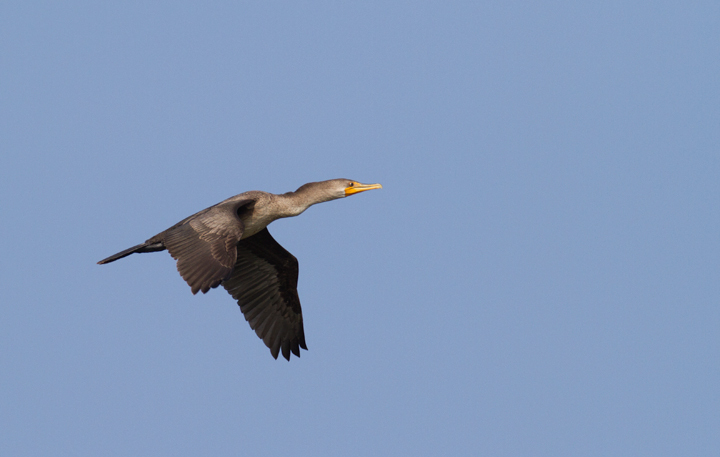 Below: An immature Double-crested Cormorant in flight at Point Lookout SP, Maryland (9/3/2011). 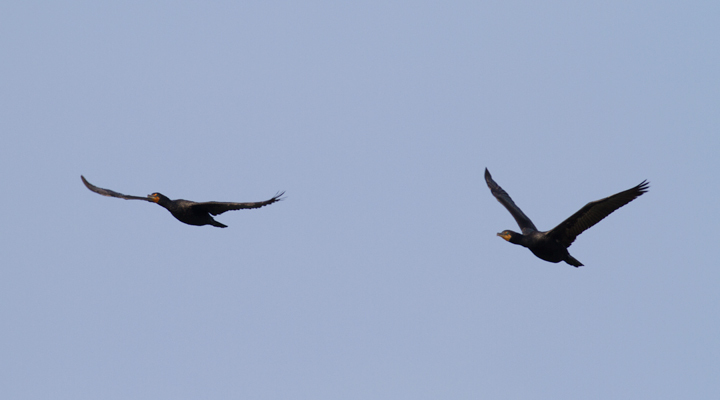 Below: Adult Double-crested Cormorants in flight at Point Lookout SP, Maryland (9/3/2011). 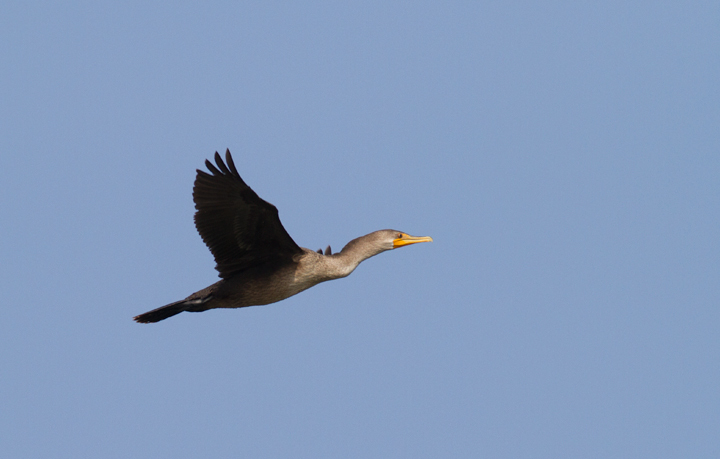 Below: Double-crested Cormorants roosting on pound nets off Point Lookout SP, Maryland (9/3/2011). 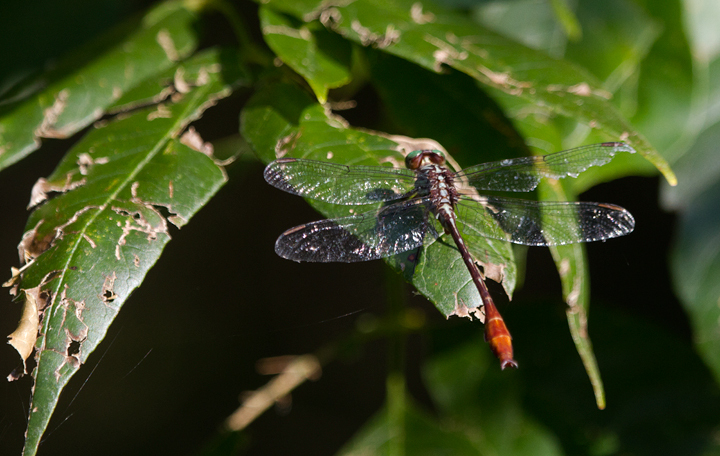 Below: My first photo of Russet-tipped Clubtail - Harford Co., Maryland (8/31/2011). 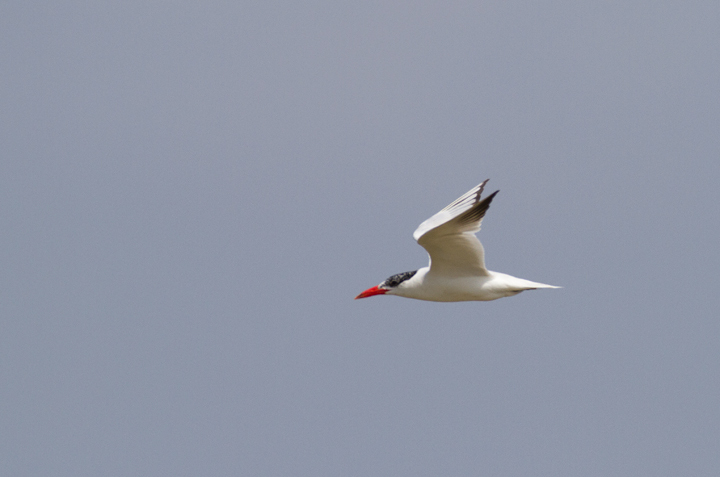 Below: A Caspian Tern in flight at Swan Creek, Maryland (9/11/2011). 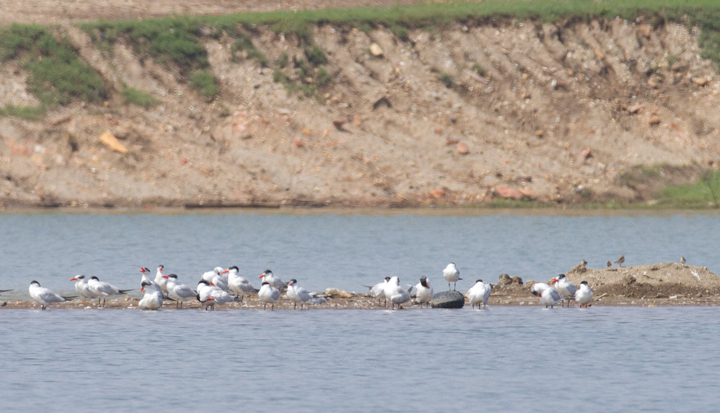 Below: Caspian Terns roosting with Laughing Gulls at Swan Creek, Maryland (9/11/2011). 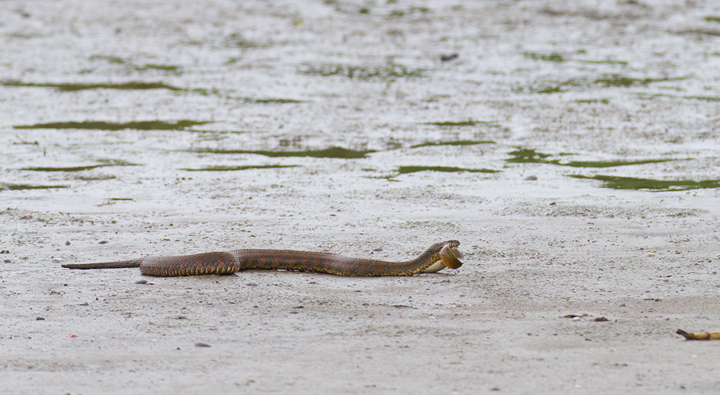 Below: A Northern Water Snake drags an American Eel to drier land to prevent his unagi feast from escaping. 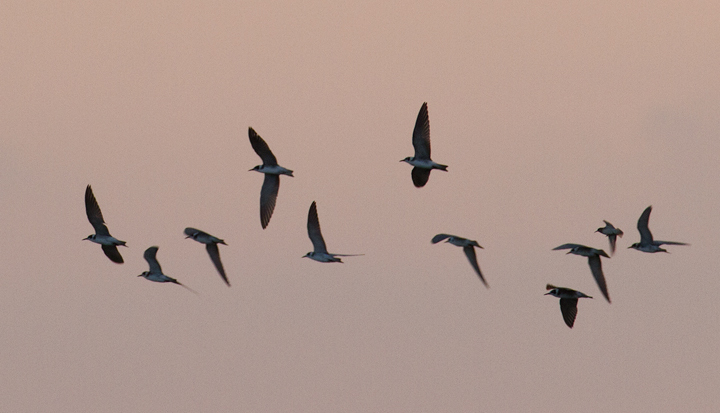 Below: Some of the 23 migrant Black Terns that were feeding in Hurlock, Maryland at dusk on 9/10/2011. 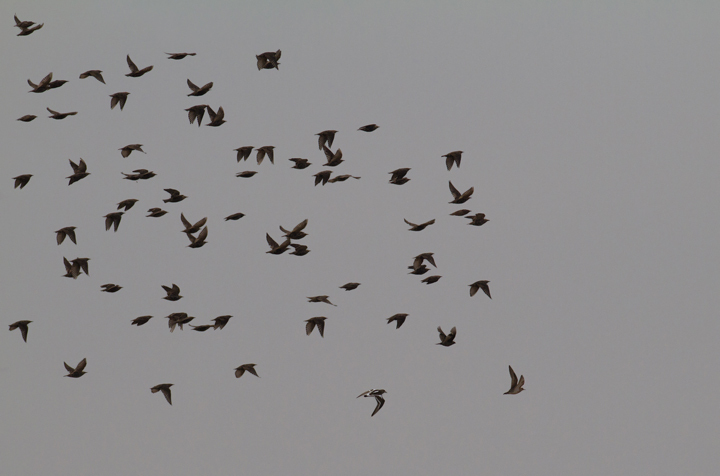 After foraging for a while, they kettled up and departed to the southeast. 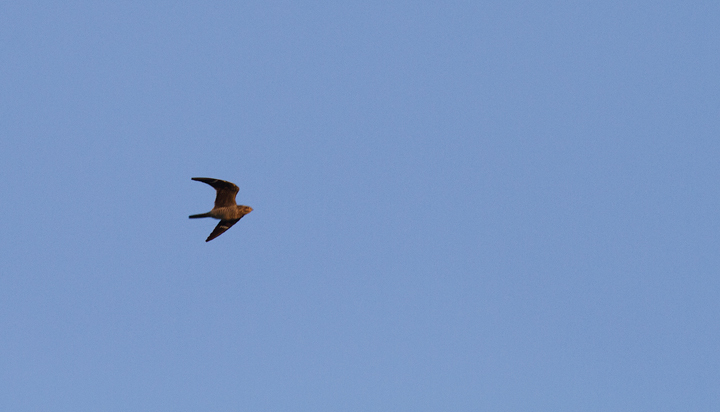 Below: A Common Nighthawk in Hurlock, Maryland (9/10/2011). 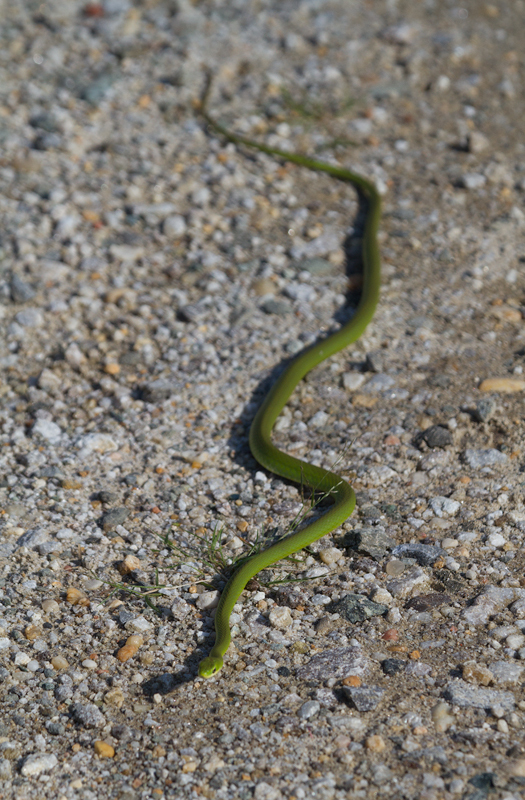 Scarce on the Eastern Shore of Maryland. Below: A nice comparison of Indigo Bunting vs. Blue Grosbeak. 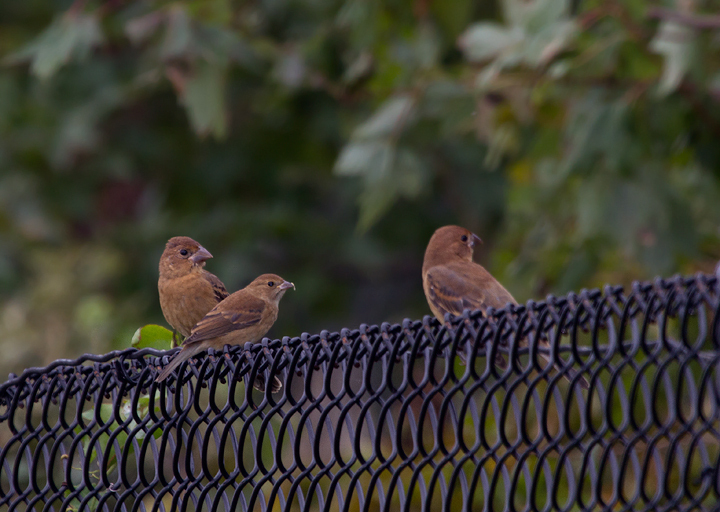 The Indigo Bunting is flanked by Blue Grosbeaks at Fort Smallwood, Maryland (9/11/2011). 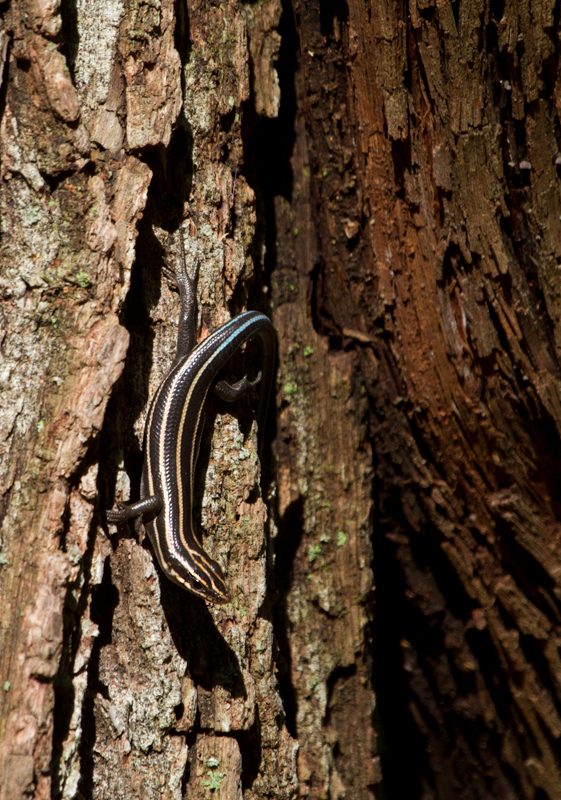 Below: An immature Five-lined Skink near my home in Anne Arundel Co., Maryland (9/11/2011). 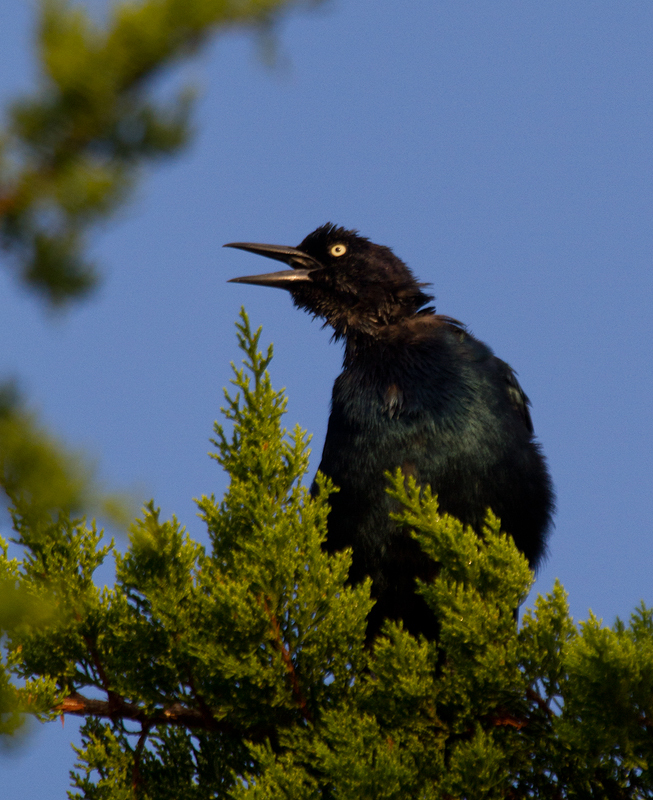 Below: Many of the Boat-tailed Grackles on Assateague Island are in heavy molt and missing tail feathers at this date (9/10/2011). 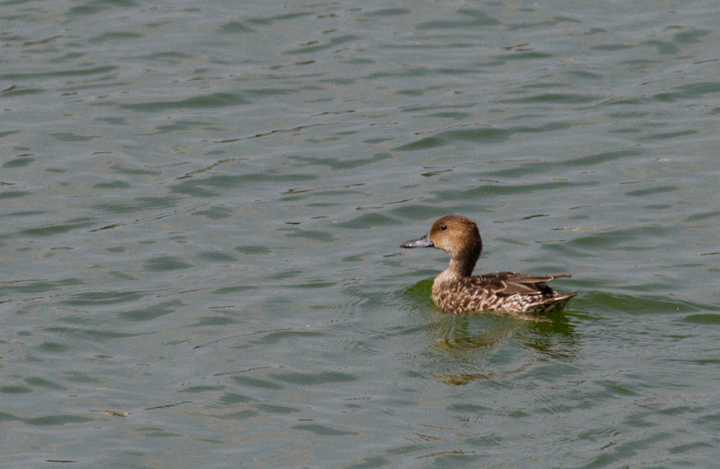 Below: A hen Northern Pintail at Swan Creek, Maryland (9/11/2011). 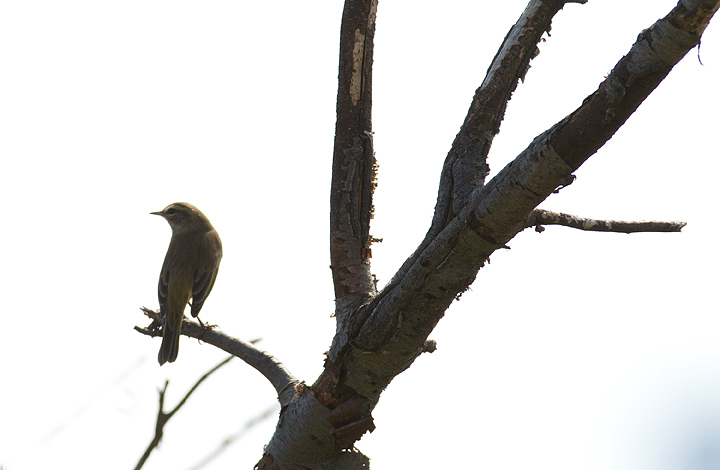 Below: The first Western Palm Warbler of the season - OK, now I believe that fall is on the way. (Swan Creek, Maryland, 9/11/2011). 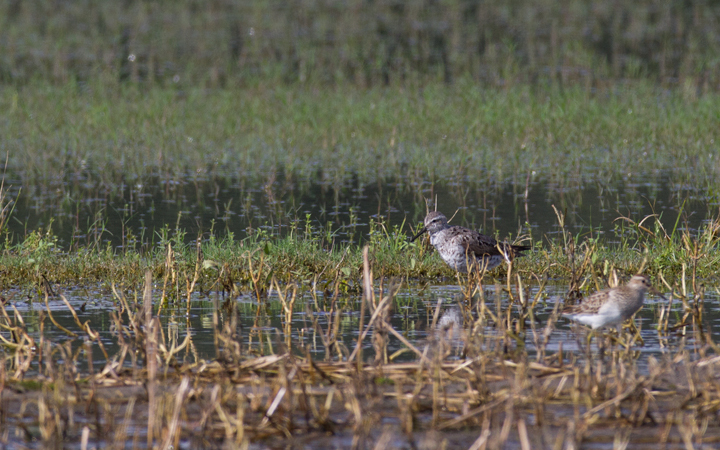 Below: A Stilt Sandpiper in Wicomico Co., Maryland (9/10/2011). 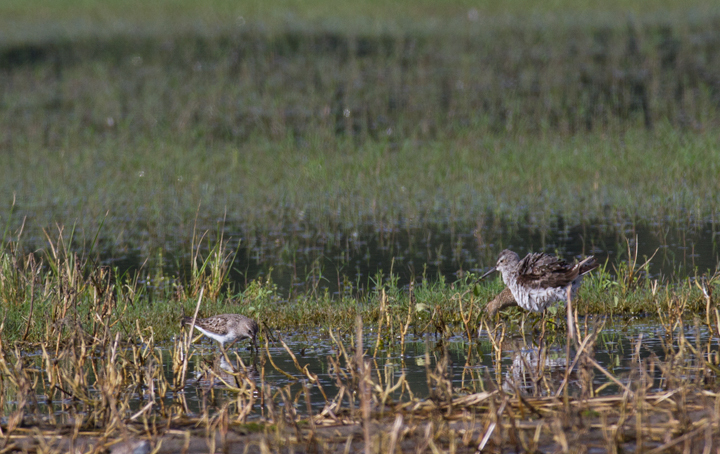 Below: A Stilt Sandpiper (right) with White-rumped Sandpiper (left) in Wicomico Co., Maryland (9/10/2011). 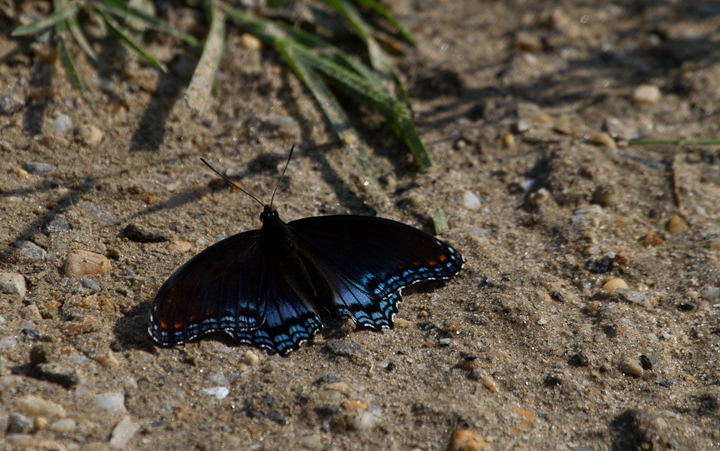 Below: A Red-spotted Admiral in Prince George's Co., Maryland (9/3/2011). 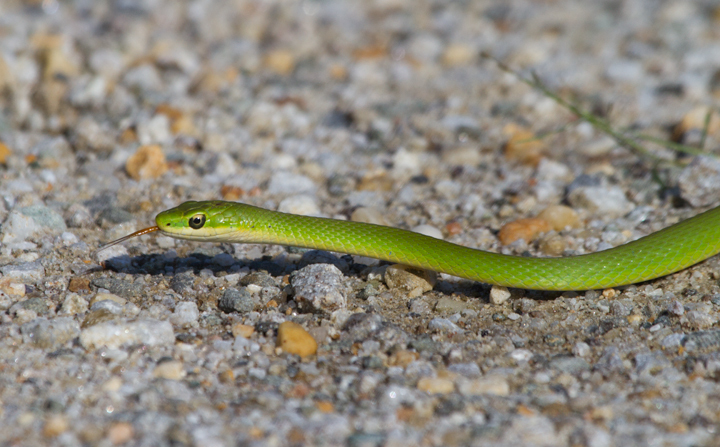 Below: A Rough Green Snake, one of my personal favorite creatures, in Prince George's Co., Maryland (8/28/2011). The thin lines down the middle of each scale make them "keeled" scales. 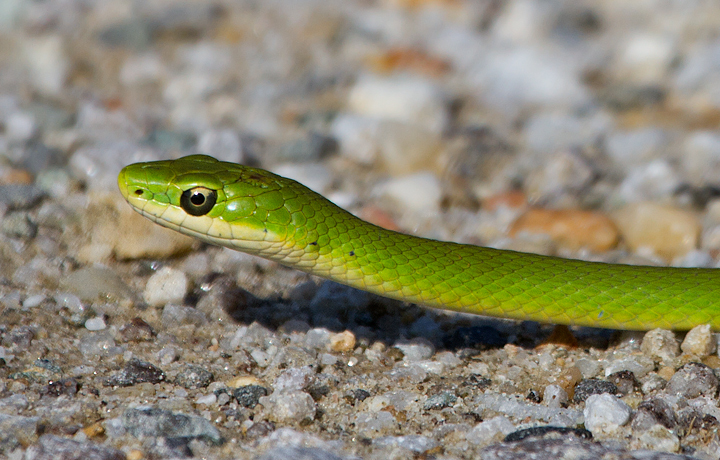 These separate it from the Smooth Green Snake, which is only found in western Maryland.